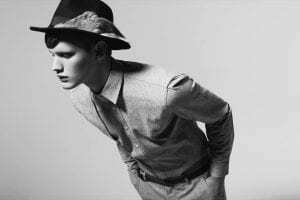 Korean Men Style – A stylish man requires a lot of effort. From picking out the right outfit to perfect matching shoes. All of this needs tremendous effort. 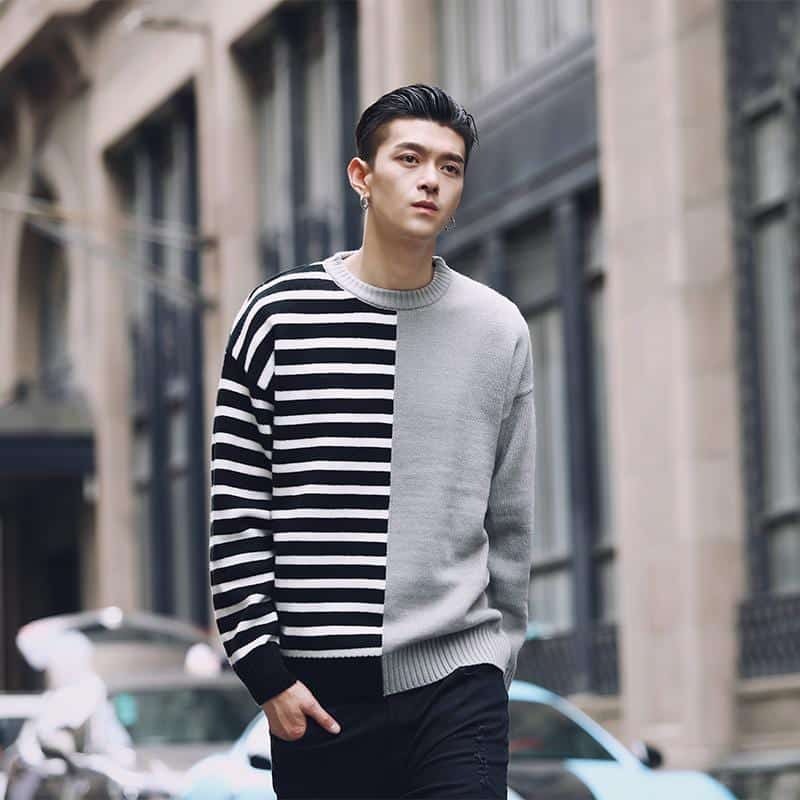 We have always come across men who are fashion lovers and are known for their good dressing sense and they are Korean boys. We must keep them in the spotlight today because they have some amazing sense of style. 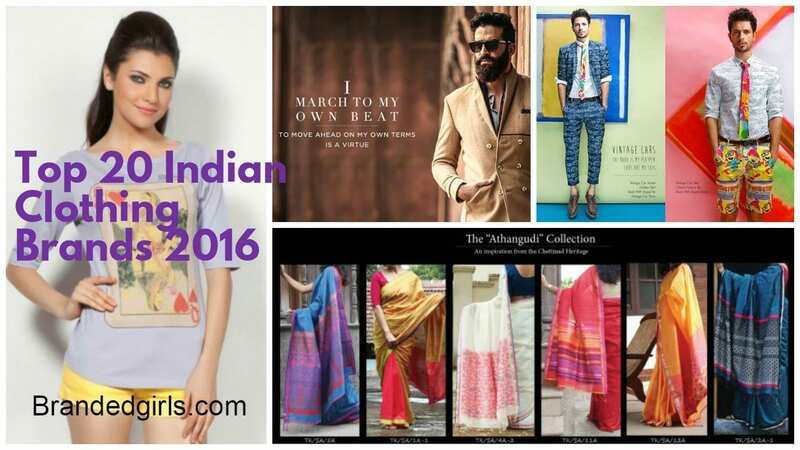 They are always updated with the newest styles and outfits available in the markets. Apart from that, they are seen wearing clothes that are top trending. Here we will give you fashion tips and ideas that can completely change your personality and will make you look smart. Make sure that you never fill your wardrobe up with lots of clothes. They will be of no use. You don’t need lots of clothes to look stylish. Even with only a few clothes you can do better. They believe that it is very important to look good when you head out. Girls nowadays are big fans of Korean male celebrities due to their cute facial looks and hairstyles. Korea is easily the most fashionable country in Asia, known for its quirky and notable trends. 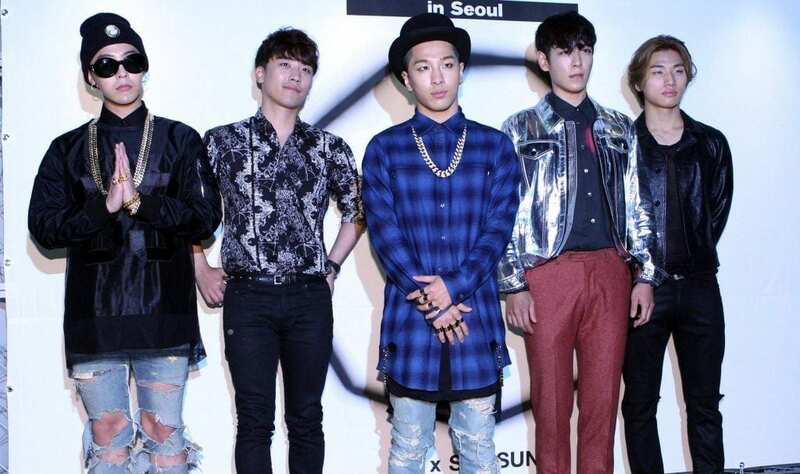 The South Korean fashion scene has seen a lot of growth thanks to the popularity of K-pop idols all over the world which is synonymous with the ‘Korean Wave’ or ‘Hallyu Wave’. The local Korean fashion market is at an estimated 44.32 billion won. 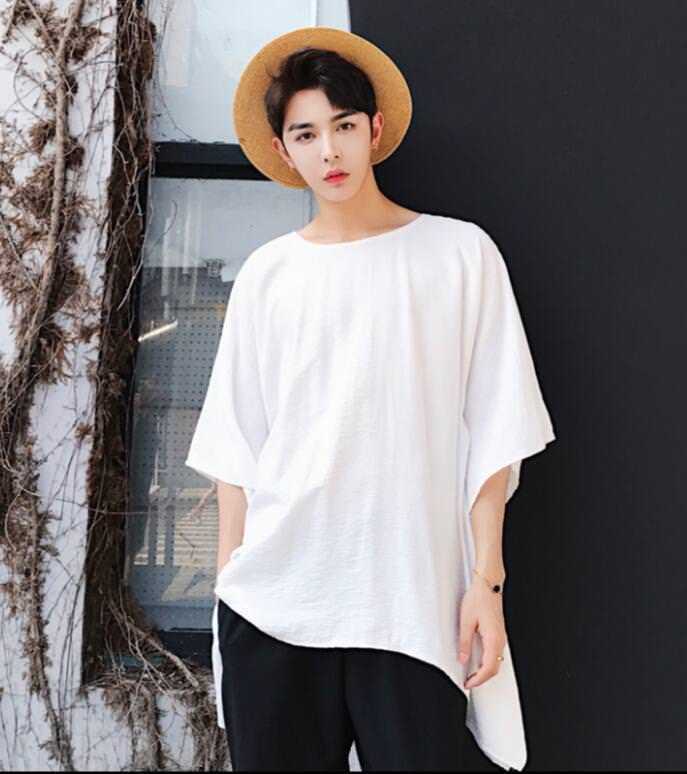 Korean fashion makes use of oversized and baggy clothing a whole lot. Men and women both are used to pairing up skin tight clothing with over sized sweaters, shirts or jackets. It’s their trademark and no one does it better than them. The model can be seen wearing this shift shirt that has a funky slant to it and is quite loose on his frame. Even this simplistic style speaks volumes because despite zero embellishments, it’s still pretty stylish. If it’s one thing that Korean fashion is known for, it’s its funkiness and quirkiness. They experiment a lot with their outfits and often make very bold choices, be it men or women. This is just one example out of a million. The sweater is beautifully patterned while the colors can blend in easily with any kind of pants or shirt you decide to pair up with. Funky sweaters are a style statement all on their own even if you don’t pay attention to anything else. Plaid shirts are universally popular. Paired with a tee underneath and matching pants, you can achieve a casual, every-day look. 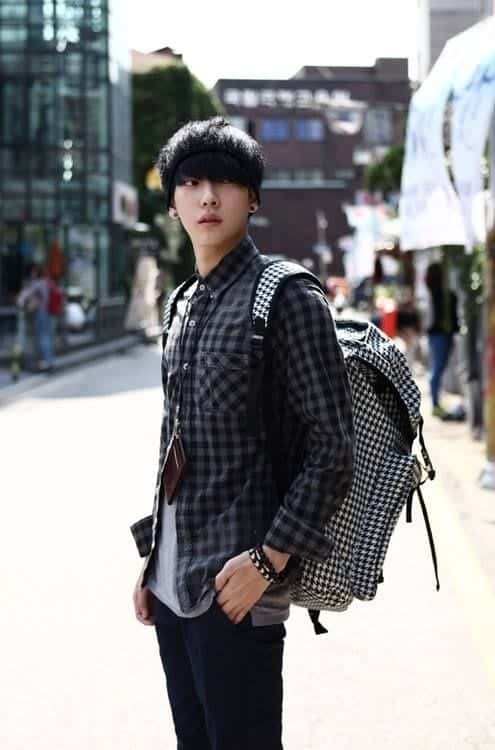 A matching backpack and traditional Korean male hairstyle, and you have your cute school boy outfit complete. This can also go for a formal look, all you have to do is wear a crisp shirt, tuck it all in and then maybe change your hairstyle a bit. Also, definitely lose the backpack and use a suitcase. Whether you’re out for a walk, going to the gym or any other casual arrangement, this is something you can go for. Especially in moderate temperatures when it’s neither too hot or too cold, you can pair up a sweater with short shorts and an amazing pair of sneakers. Note the casualness of the bag. 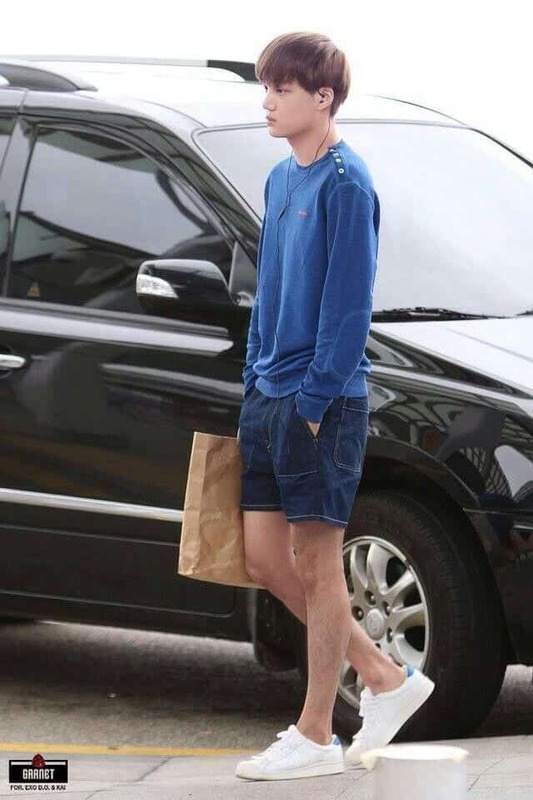 It’s basically just a paper bag, really but it goes well with the casualness of the look. You can either go with a plain sweater like this one, or something a bit more eccentric, with patterns and buttons and such. Striped clothing is its own thing. It has a way of looking uber good no matter what type of clothing it is. This striped pullover looks absolutely amazing not only because it features stripes, but also because the design is super groovy and high-end. If you want to go for a minimalist look, this is the perfect style for you. All you need is a fashionable piece that has a cool design, preferably stripes, and you can simply pair it up with a plain jeans or trousers. Korean men are notorious for being prettier than women and so they are often seen wearing makeup and jewelry. While not all men are up for that, an accessory like a ring or a watch can do wonders for your look. Looking for some Winter outfits inspiration? Well, look no further. This right here, is what’s traditionally worn by Korean men in Winters. It’s not only stylish but also practical as you’ll be completely covered against the cold and chill. The gray-black tones of the ensemble make it look especially classy. The same result couldn’t have been achieved if there was a riot of colors in there. However, considering this is Korean fashion we’re talking about, you never know. These people are known for their weird and cool fashion sense. 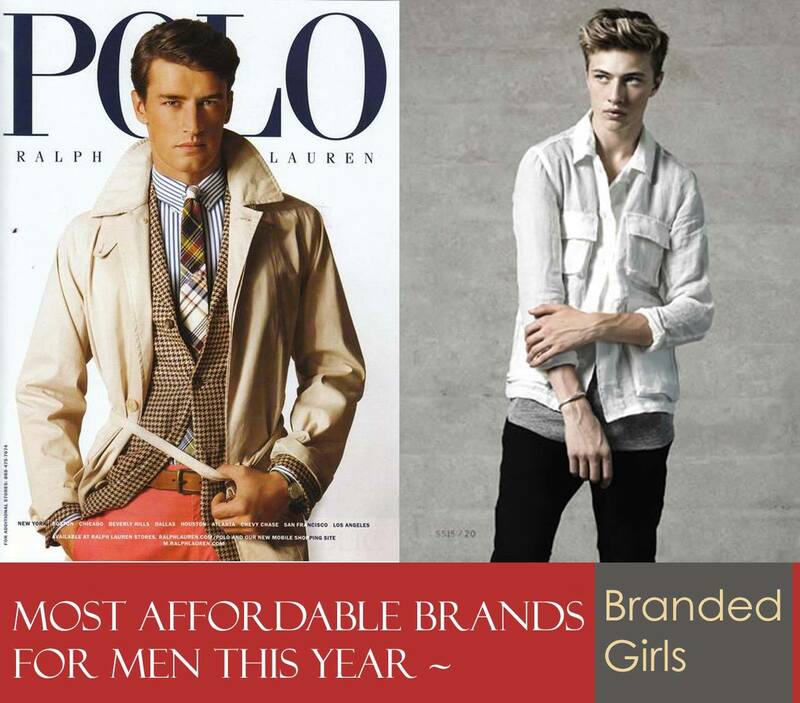 For some shopping guidance, check out 10 Most Affordable Designer Brands for Men you Didn’t Know. Another cool trend: the layered clothing trend! 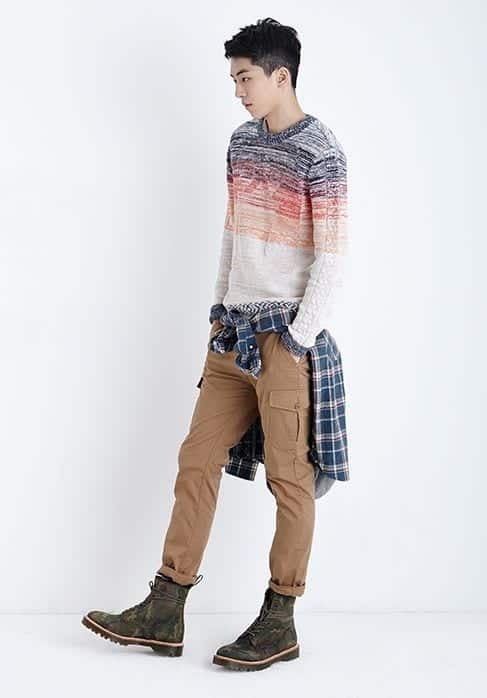 You’ll see the multiple layer trend in Korean fashion a lot. Multiple t-shirts, multiple sweaters, even pants! 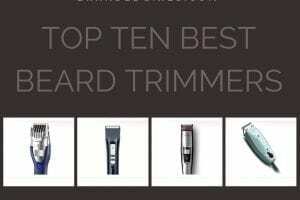 It’s definitely something we recommend you try because it’s edgy and fashion forward and safe choices are a thing of the past. This is a pretty gutsy look. We’re pretty sure no one outside of Korea has ever thought to do this before. Just look at those enormous holes! Like we said, its gutsy. Neon colors are a popular choice among the Korean fashion industry. You can see various K-pop idols and other stars sporting outfits featuring bursts of neon colors. They attract the eye pretty quickly so you can be sure your outfit will liven up and draw attention if you choose to go with such colors. 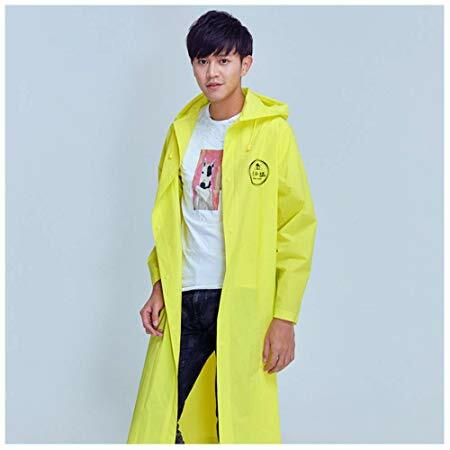 The coat the model can be seen wearing is in neon yellow and as you can see it took a boring t shirt and pants and turned them into something exciting and worth noticing. So you can make a relatively simple outfit standout if you just pair it up with a splash of neon. There will come a time when leather jackets go out of fashion, but not in the next few centuries, we conjecture. Leather has a way of making everything look better, especially black leather. The model wears a simple tee and a denim jacket beneath the leather one, the multiple-layer trend we talked about earlier. The outfit is both sleek and sophisticated and projects the bad boy image, ladies so desire to see. It is important that the jacket you’re wearing above be smaller then the one below so it can be seen properly. Okay so these leather belt suspenders are the most gorgeous things you’ve probably ever seen. 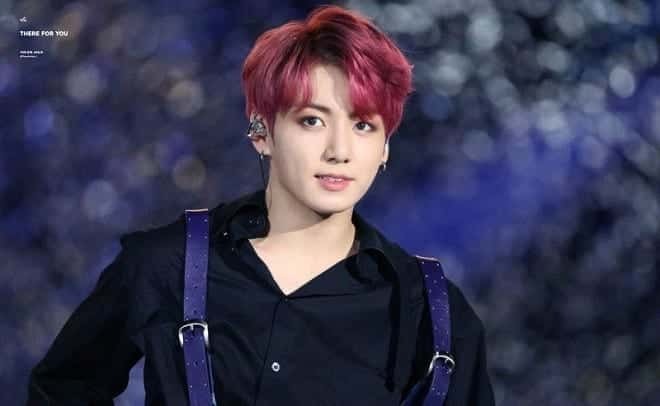 BTS’s Jungkook pulls off this look with such grace and style. It’s a sophisticated look despite the earrings and the pink hair. And if you didn’t already know that he was a famous performer, you’d mistake him for a very fashionable entrepreneur. The entire motto behind Korean fashion seems to be never wearing something that fits you completely. There are baggy items of clothing and then there are overlong items of clothing. 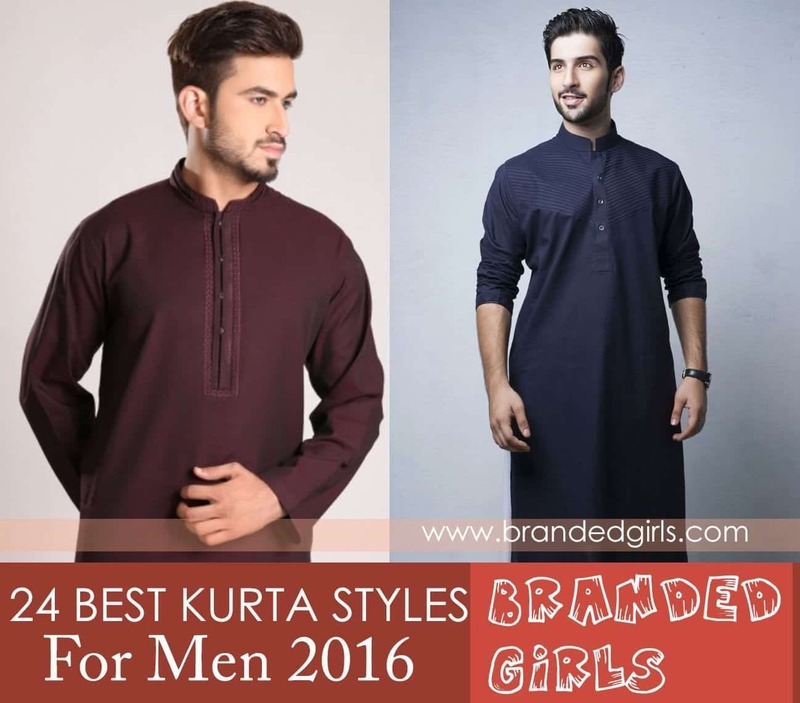 This kurti-esque shirt is really unique in its appearance, the side cut is a genius idea and you bet no one ever thought of doing such a thing before Korean fashion industry did it. Not even women have been seen wearing something this fabulous. 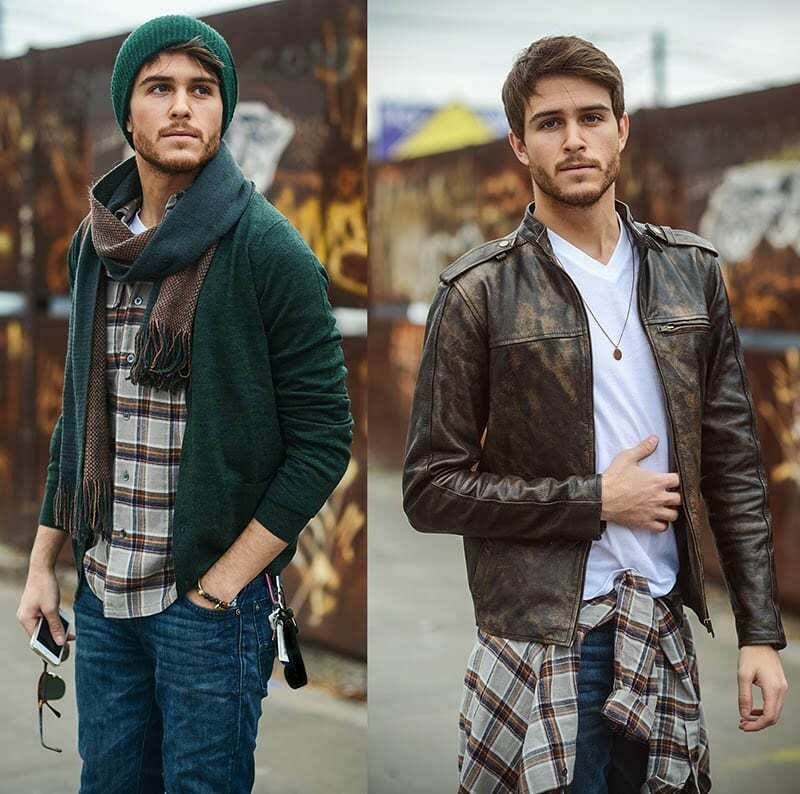 A sharp leather jacket or a baggy sweater or even pull over on top would look great as well. 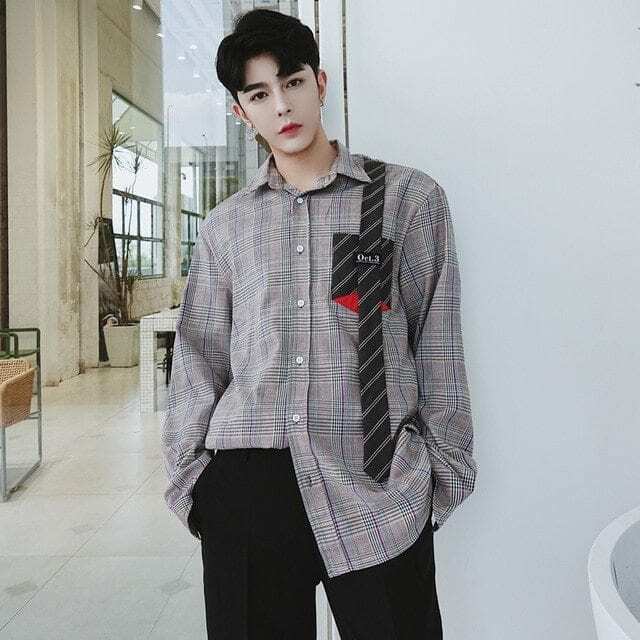 Korean boys are always sharply dressed no matter how off-the-books their styling is and that is something that is hard to pull off normally. They are super conscious about their looks and dressing which is why they always take great pains to look their best and look effortless in whatever they choose to wear. 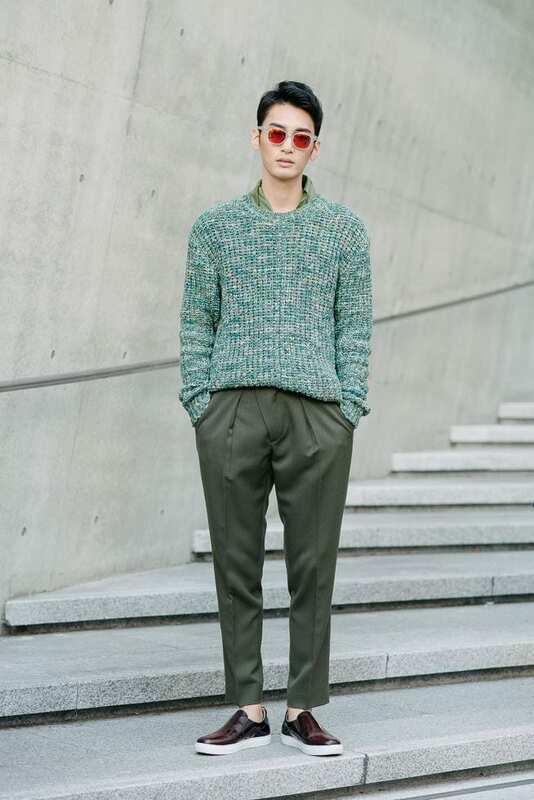 Here, the man wears everything in muted shades of green except for the sweater which looks brighter. 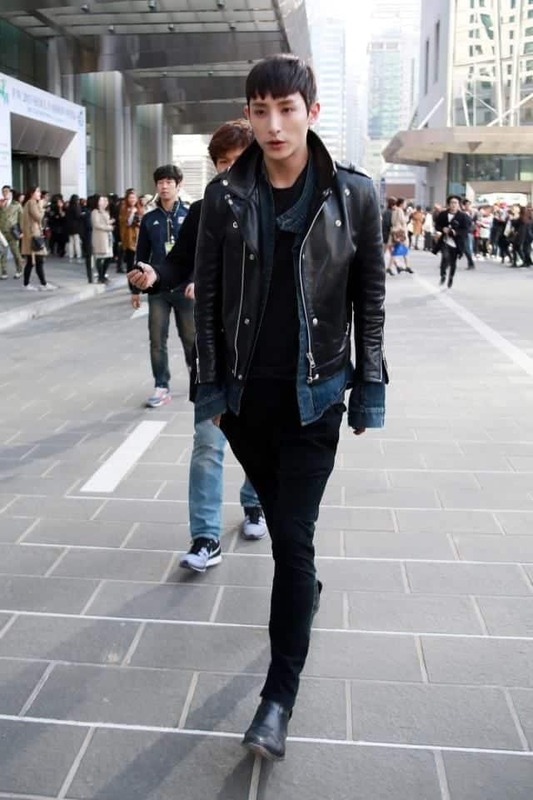 He pairs the outfit with high-end sneakers and contrasting sun glasses which look incredible. Straight out of the Victorian era. Or not? 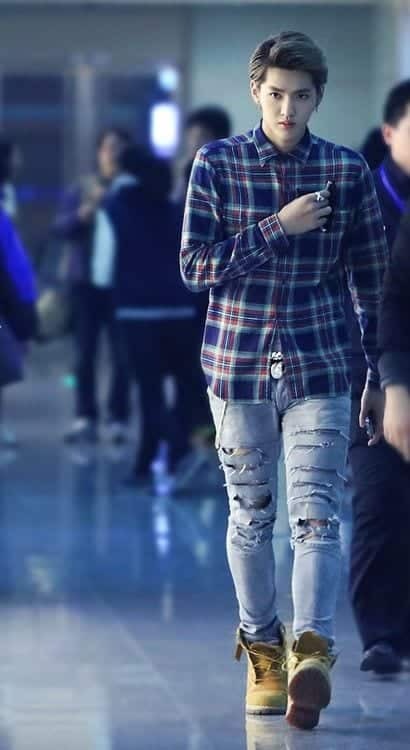 This entire outfit is the perfect example of the funkiness Korean fashion is known dearly for. It’s a plain pull over matched with cool grey trousers and this awesome jacket with puffed up sleeves that someone outside of a movie set will think twice about wearing. White, black and grey, and all items completely not in sync with each other, yet somehow, they are? All we know is, you cannot look cooler than this. So buckle up, you’re about to turn a lot of heads! 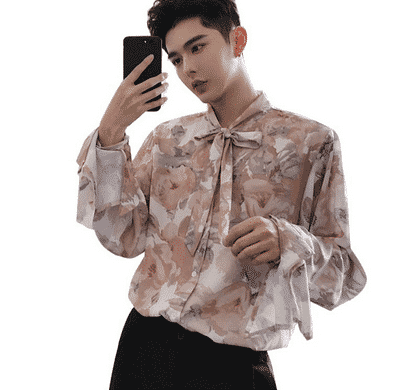 This look has a touch of femininity to it what with the washed-out, water color floral print, the material of the shirt, the sleeves as well as the bow at the top. It’s best suited for formal occasions such as dress up parties, weddings or just a gathering among friends. It’s certainly not something you can wear at a business meeting, though. Be sure to pair it up with black trousers, not pants and certainly no denim, that would ruin the formal nature of the ensemble completely. The cuts on this thing are insane. If you want something edgy and are going for a gothic, emo look, try and replicate this look. 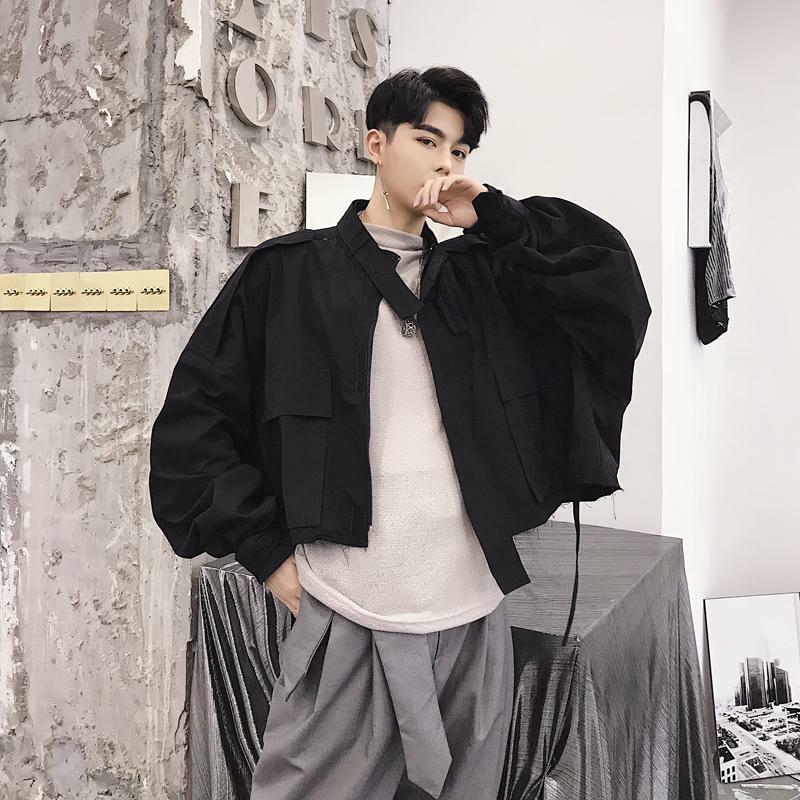 The model can be seen wearing a classy black sweater underneath the jacket, matching black pants, the traditionally floppy hairstyle and jewelry! Yes, Korean men love their accessories. 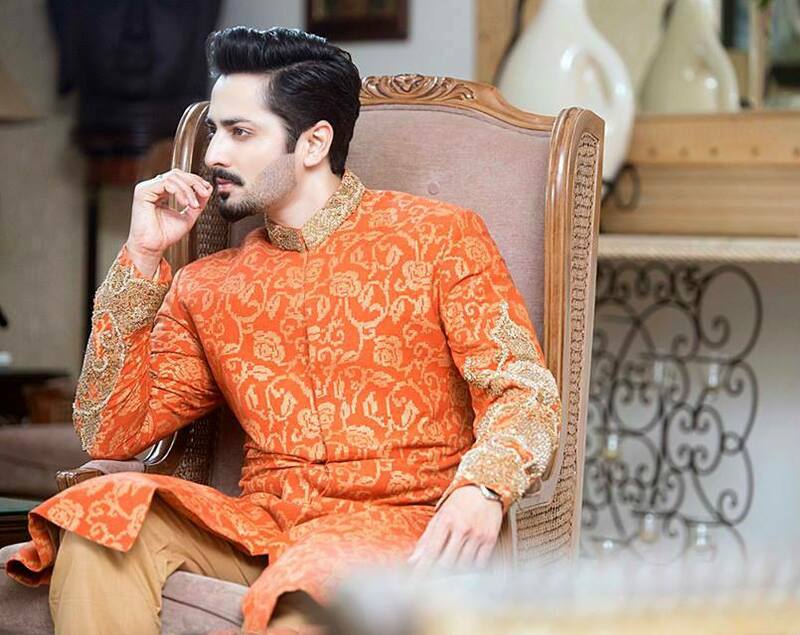 This entire ensemble oozes class and refinement. 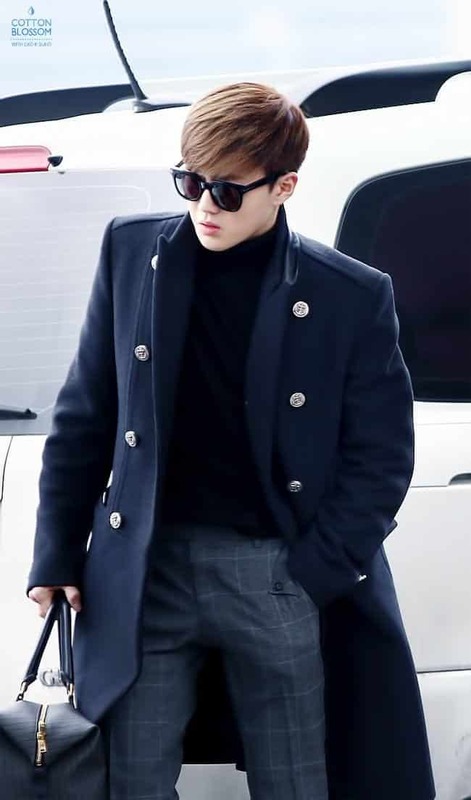 First up there is the plain wool shirt underneath, then plaid pants, the extremely handsome coat, a designer bag and stylish sunglasses. Go for a single color theme, preferably darker like shown in this picture. You just can’t achieve this level of perfection in something lighter and brighter, especially if you’re a business man. 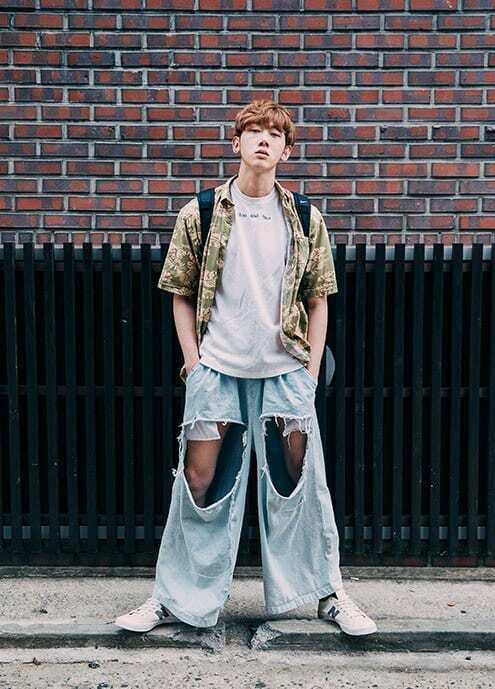 Ripped pants are old news kept fresh by its continuous appearance in Korean fashion. 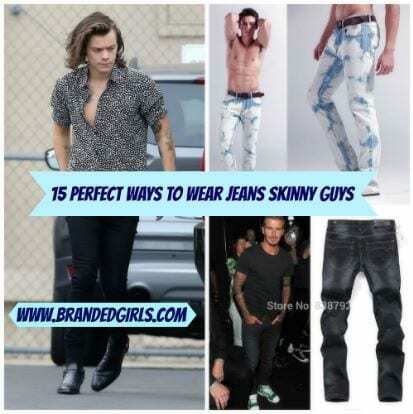 The bleached and ripped denim can be seen almost everywhere, on both men in the form of pants and in women in the form of pants and skirts. 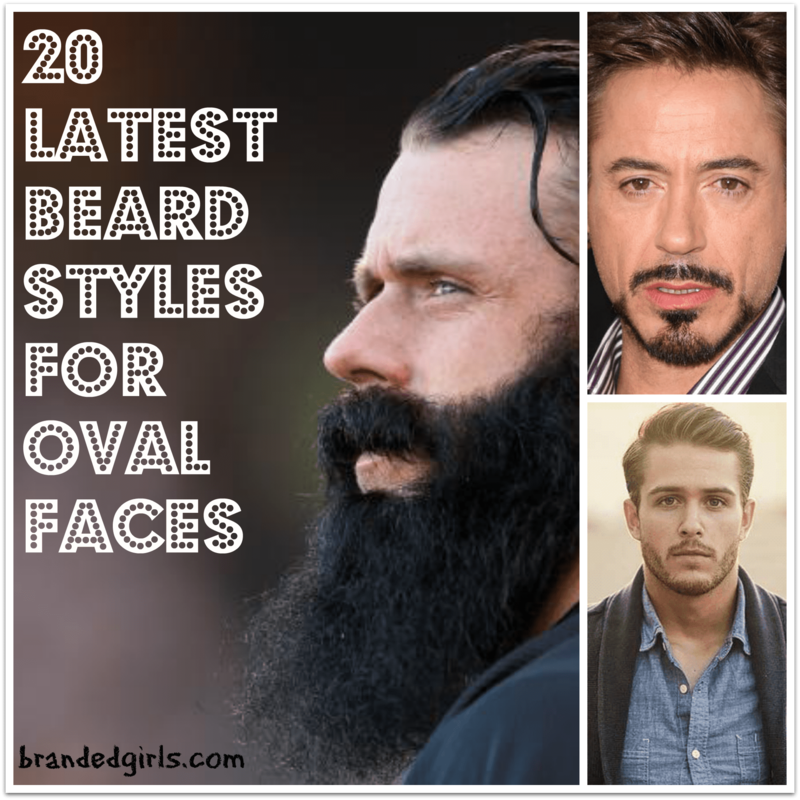 These can be paired with plaid shirts, t-shirts, sweaters, jackets and even coats. Nothing says hip hop better than a cap worn backwards. But if you’re looking to make more of a statement, here is some colorful and fashionable inspiration. All elements, we’ve already described. Stripes, layers of clothing, splash of color amid monotones mixed with daring that will let you make bold choices, no regrets later. 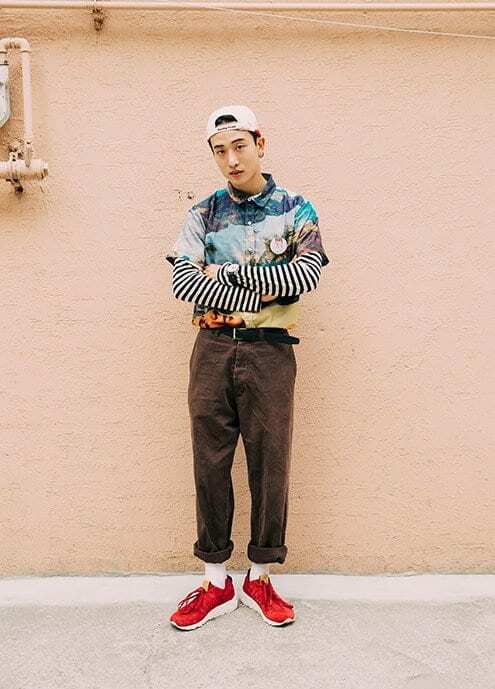 The half-sleeved printed shirt has some really nice colors that mix well with the black and white of the stripes, the brown of the pants and the red of the shoes. This is what you need to do; find a mixture of colors that suits you and then pull it off effortlessly with confidence. That is certainly one way of using a tie, isn’t it? The pocket on the shirt is on odd with the shirt itself but matches the tie perfectly and that is why it manages to look classy. The half-tucked aspect plus the unbuttoned sleeves give the look a careless yet controlled feel which is pretty smart, to be honest. The model pairs the shirt up with black pants and the black, grey and a small splash of red makes for an elegant combination. This is something you can do on both informal and formal occasions. All you have to do is take any stylish shirt and then tuck one end in, leave the other out and as for the tie, leave it anywhere but the place it’s supposed to be and you would have made a statement. 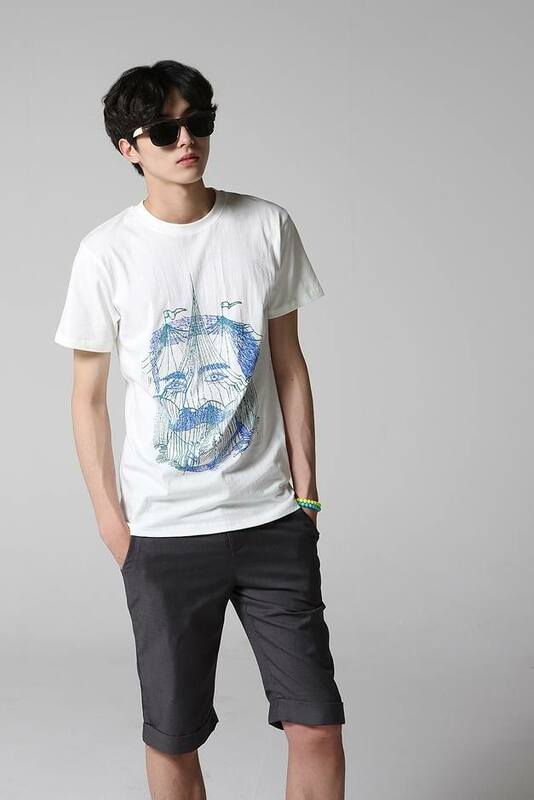 there are suho,kai and kris from EXO. There are suho, kai and kris from EXO and I am an EXO-L.